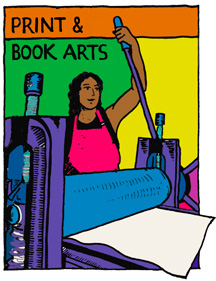 Letterpress and printmaking classes are now offered year Round. Foothill College offers Letterpress, Book Arts and Printmaking instructions in the Graphic Design and Visual Communication program. The college operates a letterpress studio with one Reflex Flatbed, a Kelsey & a Curtis & Mitchell Columbian No.3 tabletop, an 8” x 12” Gordan Platen and an Old Reliable Platen press with metal and wood type. At least 100 cases of book and display type. Studio 1801 operates as a Green environment.